Outdoor rectangular area that is 110 m long and set up for archery; it is surrounded by an exclusion zone for the protection of the spectators. Official whose responsibilities include monitoring the competition’s progress, settling any disputes that may arise and monitoring the shooting time with sound signals. Distance from the target whose diameter is 122 cm in the final round of a mixed competition. 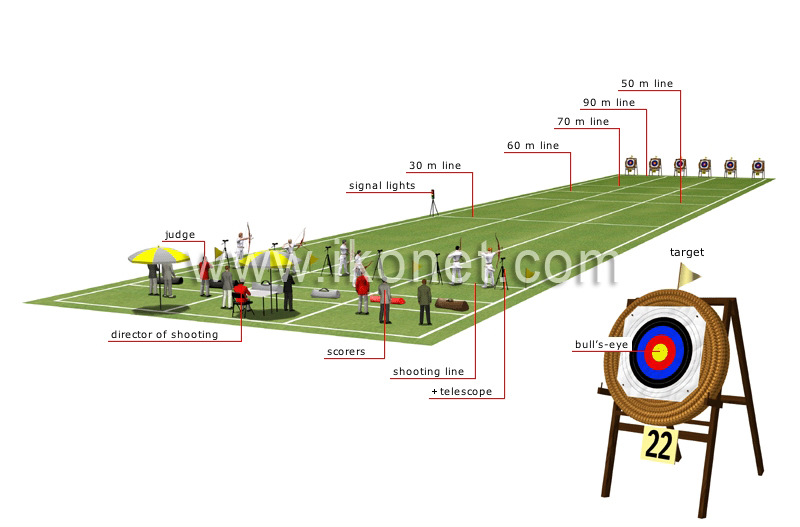 Distance from the target whose diameter is 122 cm in the first round of a men’s competition. Officials who are in charge of registering the points obtained by the archers. Line at which the archer stands to shoot with one foot placed on each side of it. Optical instrument whose use is authorized for making out the precise spots where the arrows hit the target. Distance from the target whose diameter is 80 cm in the first round of a mixed competition. Official who checks various elements, such as the shooting distances, the size of the targets, equipment compliance and the archer’s position, and ensures that the time is respected. Lamps accompanied by sounds that mark the progress of the competition (such as the positioning of the archers on the shooting line and the end of the shoot). Distance from the target whose diameter is 122 cm in the first round of a women’s competition. Surface of varying diameter at which the archer shoots; it is divided into concentric circles corresponding to point zones. Circle 12.2 cm in diameter in the middle of the target; it is 1.3 m from the ground and worth 10 points. The value of the other circles decreases toward the edge of the target.